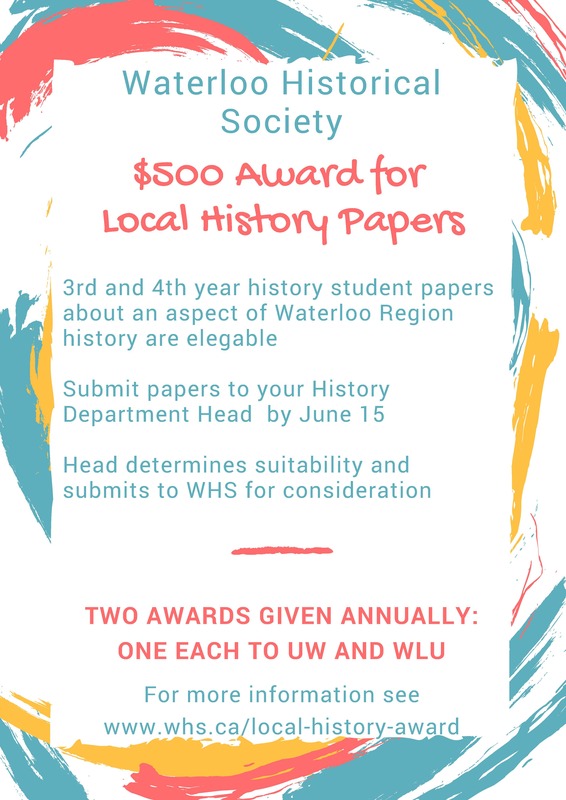 Third- and fourth-year history students at the University of Waterloo and Wilfrid Laurier University are eligible to apply through their respective department for an annual $500 local history award offered by the Waterloo Historical Society. Along with the cash award is the possibility of having their paper published in the annual volume of the society. 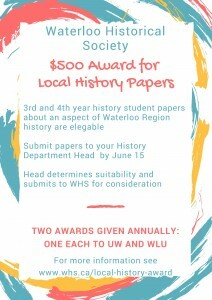 Waterloo Region history must be a significant aspect of the paper’s research but the overall theme may take in a wider area. The student or an instructor submits the paper to the department head and a decision on the winning student paper is made at that level. Waterloo Historical Society then receives a copy and presents the student with the award. At that time, publication is discussed with the student because, most of the time, further work is required to adapt the paper to publication standards. It is usually a shortened version of the original that is published in the annual volume. For most students who have won awards, it is his or her first published work. These papers provide the society and future historians with thoroughly researched articles. A number of the award-winning papers that WHS has published through this program have broken new ground in regional history research.